Linearizes the number of pixels locally in an image, based on a specific color space. This can be used to bring out the detail in dark areas of an image, and smooth the edges between blocks. This class is available in the Medical Toolkits. This class applies the histogram equalizer locally on the image. The image is divided into local rectangles of dimension (Width, Height). The number of pixels inside each local rectangle are linearized according the histogram calculated for an extended rectangle around each local rectangle. 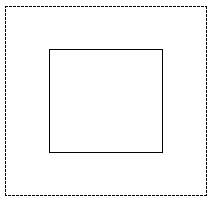 The extended rectangles are of dimension: ((Width+2 * WidthExtension) , ( Height + 2 * HeightExtension)). For an example, see the following drawing: A rectangle and its associated extension, where the histogram is calculated. Use this class to bring out details in an image that has portions that are too dark or too bright. An example of this is a picture taken with a flashlight in a dark room. In such a picture, the subject receives good light while the background is very dark. The application of the local histogram brings out details, but creates a blocky artifact. Use Smooth to reduce the blockiness of the result. Run the LocalHistogramEqualizeCommand on an image. // Local Histogram equalize the image.
' Local Histogram equalize the image.